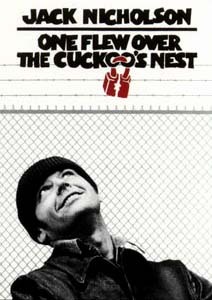 Based on Ken Kesey's anti-establishment novel about a troublemaking convict (Nicholson) who is transferred to a mental hospital, once there he tries to rally the patients against the head nurse (Fletcher). Milos Forman (who also won the Oscar for direction). With Will Sampson, Vincent Schiavelli, Louisa Moritz, Michael Berryman, Peter Brocco, William Redfield, Christopher Lloyd, Scatman Crothers, and Danny DeVito. Michael Douglas (1945 - ) American leading man who's father is Kirk Douglas. Douglas's other works include: COMA, THE CHINA SYNDROME, ROMANCING THE STONE, A CHORUS LINE, FATAL ATTRACTION, and WALL STREET. Lawrence Hauben and Bo Goldman received the Screenplay (based on material from another medium) Oscar. First time in 40 years a picture has swept the top five catagories. All of the pictures on this site have been gathered from the internet, WWW, usenet or in any other way, none of the images have been produced or scanned by ourself neither do we have the copyright on any of these images, therefore if the copyright owner of any of the pictures on this website has a problem with us having these pictures here, please email us and we will remove the images from this website. Email the webmistress for comments or new suggestions concerning this site.